Wow! Talk about new beginnings! 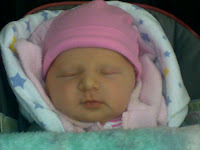 Yarden Avia was born on Sunday, January 17th, in Mayanei HaYeshua Medical Center. Shlomit received the best treatment possible (and believe me that it makes a difference that they know who you are!). All are fine, and it is a great trade off: sleep for a tiny new person. The new year really didn't make any impression whatsoever. It was a regular day at work, and almost went by totally unnoticed. Strange, but I suppose Tisha B'Av doesn't affect most of China that much, either. New Job? Now here's a juicy item. Let me get my head around it, and I'll tell the story.